This is a tournament to help fundraiser for the UNC Bears' Ultimate Frisbee team. This year we will be playing 2 courses at UNC. One on Central Campus (10th ave and 18th st area) and one on West Campus (regular location). This will be the only opportunity that players will have to play the Central Campus course. Don't miss out. This event will be set up in two separate tournaments. 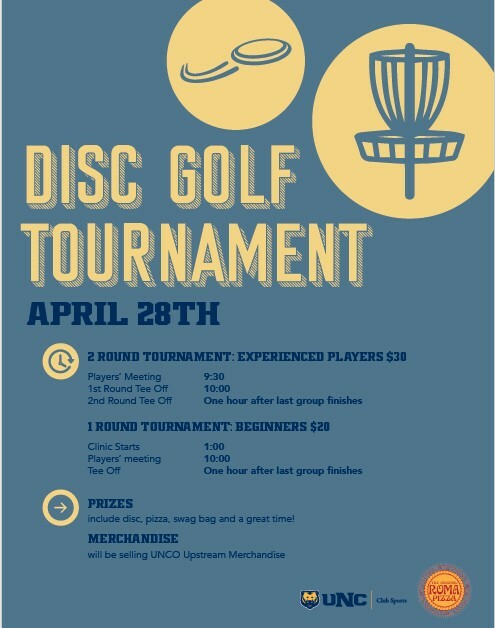 One two-round tournament for all experienced players (General Registration) and then a one-round tournament on Central Campus only for all beginners. There will be a clinic prior to the start of the beginner round, for anyone new to the sport. This event is sponsored by The Original Roma's Restaurant, who has kindly provided dinner following the tournament and hosting the awards ceremony. There will be plenty of prizes and giveaways, so come prepared for fun! Day of sign-up welcome, but doesn't guarantee players' pack. To ensure players' pack, register online. Otherwise, the day of sign-up is first come, first serve. Josh Wainscott is responsible for all refunds/cancelations. - 10:00am Sign-In/ Registration/ Practice for Experienced group. - 12:30pm Round 1 for the Experienced Group begins on Central Campus Course- Followed by 1-hour lunch on your own.